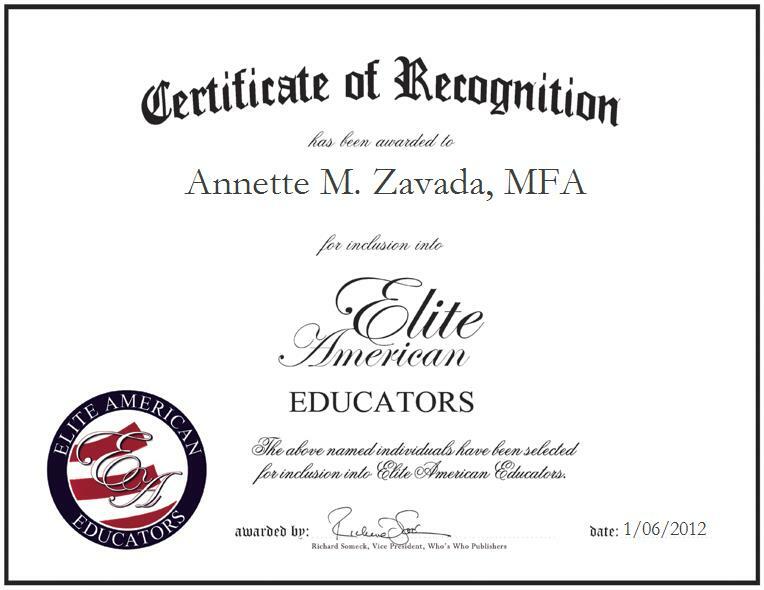 Annette M. Zavada, MFA is a Teacher and Artist for the Early Childhood Education Department of Hallen Elementary School. With a strong background in art and language arts instruction, Ms. Zavada helps her students by teaching family literacy, history, early childhood education and social studies. She also teaches and creates art. Over the course of a career that has spanned nearly three decades, Ms. Zavada has nurtured a versatile skill set. She is an artist who taught at an Indian reservation for five years. She is also a recipient of the State Mentor Award. Ms. Zavada is currently pursuing a Master of Fine Arts in Studio Art at Kean University. She remains current on trends and developments in education as a member of the Bridgeport Education Association, the Connecticut Education Association, the New Jersey Education Association and the National Education Association. In her spare time, Ms. Zavada enjoys practicing yoga, downhill skiing, golfing and playing racquetball.